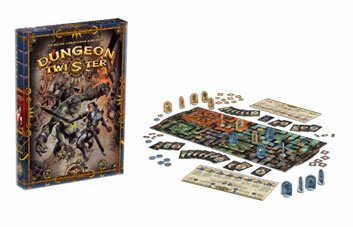 View the "Play by Play"
Dungeon Twister is a board game for two players. You are in control of a team of eight adventurers with a range of amazing powers and abilities. Whoops, sorry. For that last one, you'll have to wait until the next game expansion comes out. Dungeon Twister is definitely not just a simple game in a box: designed to be played casually or in tournaments, add-on components will soon be available with the same rules, but that will introduce you to new characters, new rooms and new objects. You will also be able to play with four players! A game of strategy, Dungeon Twister call on the tactical senses of the players as well as their bluffing skills! Other products in the "Dungeon Twister" series. Excellent two-player game with an interesting cast of characters with special abilities, a unique setting and tons of options each turn. If the theme appeals to you and you like games with all strategy and no luck, Dungeon Twister is a must buy. Tactics and brain-burn like an abstract game, but dripping with theme! This is not a dungeon crawl game, despite the theme. It actually plays more like an abstract/pure tactics game like checkers or chess - but with a but of hidden information added in. Highly recommended to those who like heavy games that reward careful thought and attention to detail. This is a pretty unique game, and while the theme is well-chosen and meshes well with the gameplay, it does not feel like parties exploring a dungeon. It's much more like two teams of combatants working through a torturous maze to get at each other or escape through the cracks. Lots of thinking here!